Add some olive oil to a hot frying pan and fry the onion and garlic for 2 minutes. Transfer to a large bowl and allow to cool. Into the bowl add the rice, cherry tomatoes, cottage cheese, basil & tomato purée and mix together. Season with salt & pepper. 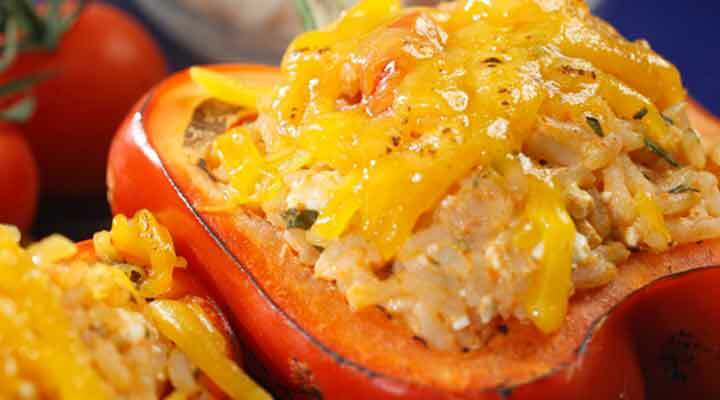 Place the peppers in a large baking dish and spoon the cottage cheese/rice mixture into them. Bake in a preheated oven at 180°C for 20 minutes. Remove from the oven, sprinkle over the grated cheddar and bake for a further 5 minutes.